Here are some interesting trivial tidbits about the Beatles' Sgt. Pepper's Lonely Hearts Club Band to amaze your friends with! 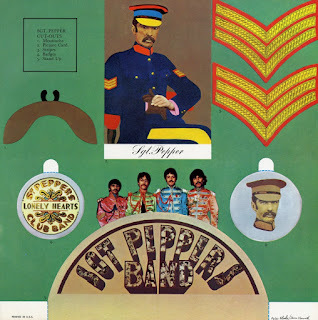 On the back cover of Sgt, Pepper, George Harrison appears to be positioning his fingers to make the letter "L," while John Lennon appears to be making a "V" shape with his hands and Ringo appears to form an "E." The three Beatles are supposedly trying to spell the word "LOVE," but Paul, his back to the camera (taken as a clue by some fans that he is dead), doesn't provide an "O." In fact, this is a mirror image, as evidenced by the outtake photo below. Ringo, John, and George are making the same shapes, in reverse, with their hands, but Paul - facing forward - is merely holding his hands together. No love here. 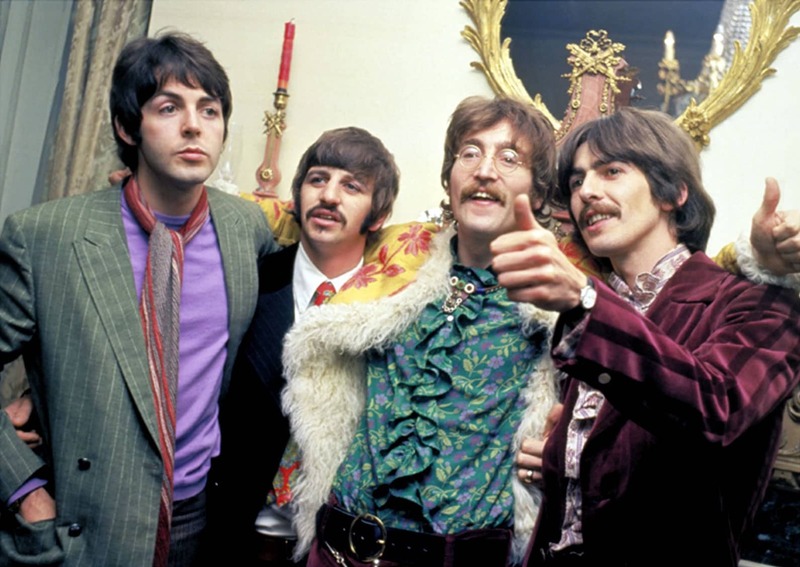 Official Beatles biographer Hunter Davies sat in with John and Paul while they composed "With a Little Help From My Friends" at John's house in Weybridge outside London. As Davies describes the songwriting session, John and Paul would exchange ideas back and forth and sometimes jam on the piano or ad-lib a bit when they got stuck. John's wife Cynthia and Beatles associate Terry Doran were also in the room. The date was March 29, 1967 - one day before the photo session for the Sgt. Pepper album cover. "With a Little Help From My Friends" was recorded the same day it was written, during a late-night session. At the beginning of the session, it was still untitled, so Paul - noticing that John had an injured finger - gave the song the working title of "Bad Finger Boogie." Two years later, when the Beatles' Apple record label signed a Beatlesque group called the Iveys, Paul had them change their name to Badfinger. During a Sgt. Pepper session, EMI producer Norman Smith, a former Beatles recording engineer, stopped by and introduced the Fabs to a new London band he was producing - the Pink Floyd. (The definite article was later dropped from their name.) The two bands exchanged what was described as "half-hearted hellos." 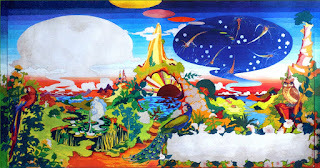 Former Pink Floyd guitarist David Gilmour, who had not yet joined Floyd in 1967, owns the original "Lucy In the Sky With Diamonds" painting done by Julian Lennon. 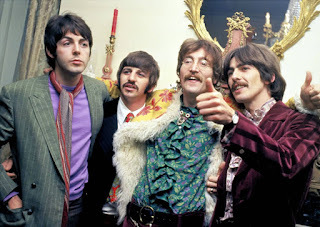 As noted in an earlier post, "Getting Better" was prompted by drummer Jimmy Nicol's response to how he was faring as Ringo Starr's temporary replacement during the Beatles' 1964 world tour: "It's getting better." Though Paul wrote the bulk of the song, John contributed the line "It can't get no worse," which Paul described as a comment that was "so John." Paul wrote "Fixing a Hole" about the home improvement project he was undertaking at a house in Scotland he'd just bought. He'd retreat there after Abbey Road was released, pondering how to go forward in the 1970s. I mentioned before that the name Rita in "Lovely Rita" was inspired by an assonance rhyme with "meter." There are two different stories of how Paul came up with the idea of writing a song about a parking meter attendant in the first place. One story goes that it was supposedly prompted by an American friend of Paul's when, while walking down a London street, Paul and his Yankee pal saw a female parking meter attendant - a new phenomenon in Britain then - and the unnamed American said to Paul, "I see you've got meter maids over here these days." Paul says he came up with "Lovely Rita meter maid" as a result while at the piano at his father's home in Liverpool. Some time later, though, a real-life parking meter attendant named Meta Davies claimed to have inspired the song when she gave Paul a parking ticket. "Lovely Rita" features comb-and-tissue-paper percussion. "Good Morning Good Morning" was inspired by a breakfast cereal jingle John heard on television. The line "It's time for tea and meet the wife" refers not to having tea with one's spouse but instead refers to having tea while watching "Meet The Wife," a British sitcom that had ended its run in December 1966. What was the inspiration for the title song of Sgt. Pepper? It depends on who you ask. One story says that the words "sergeant" and "pepper" came to Paul for no apparent reason, while another story goes that he and Beatles assistant Mal Evans were on a plane together and Evans asked what the "S" and "P" on the bags that came with their in-flight meals stood for. "Salt and pepper," Paul said, following it with a joke - "Sergeant Pepper." 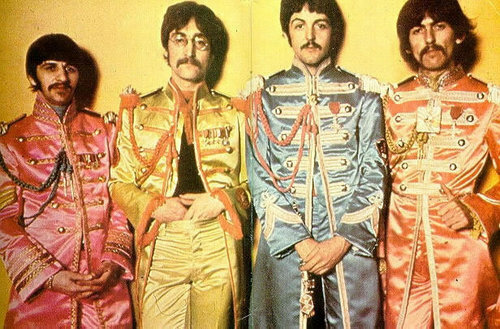 The Lonely Hearts Club Band was inspired by the colorfully named brass bands that populated the north of England at the time. A dog whistle follows the fade-out of "A Day In the Life." The frequency is barely noticeable to human ears on the CD version. The chatter in the inner groove of side two that the Beatles placed there as a joke played for two seconds on record players with automatic pickup, ad infinitum on those without. Played forwards, it sounds like the Beatles are saying, "Never curse your tanning underwear." Played backwards, it allegedly sounds like "We'll f**k you like Superman." Engineer Geoff Emerick insisted there was no intended hidden meaning. A reproduction of the run-out groove was included on the original compact disc release and re-mastered vinyl and cassette versions of Sgt. Pepper in 1987; it had been deleted from British vinyl editions of the album after its original pressing and had never been included on previous American vinyl pressings. The inner groove notwithstanding, Sgt. Pepper's Lonely Hearts Club Band was the first Beatles album to appear in the U.S. exactly as it did in the U.K. 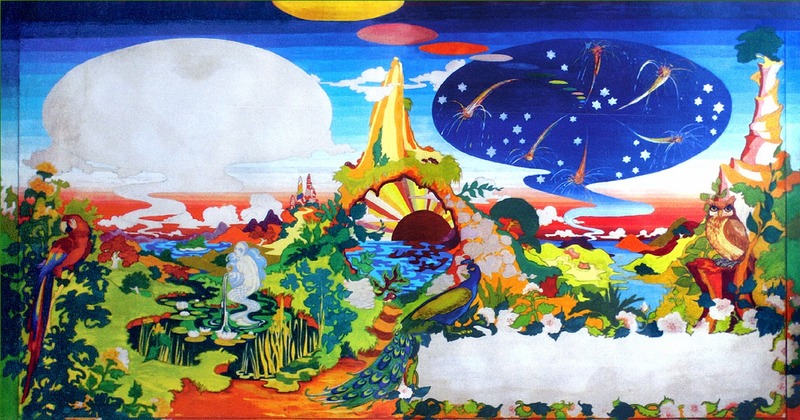 The Dutch designer group The Fool did a psychedelic painting for the LP cover's gatefold (below). It was rejected. Producer George Martin wanted Geoff Emerick to get a credit for his engineering work, but an unidentified EMI boss nixed the idea in an in-house memo with three question marks next to Martin's request. The 1987 compact disc issue gave Emerick his well-deserved credit. The working title of the LP was One Down, Six To Go, a reference to their January 1967 contract with EMI, which apparently required them to deliver seven albums. Sgt. Pepper is the only Beatles album not released in the U.K. on a Friday, the day of issue for new recordings in Britain in the 1960s. The Beatles wanted it out on the first of the month to make a symbolic statement, and the first day of June 1967 - its month of release - happened to be on a Thursday. Ironically, it was released on a Friday in the United States - the next day, June 2, 1967. Record releases in the U.S. happened to be on Mondays or Wednesdays at the time. The launch party for Sgt. Pepper was held on May 19, 1967, at Beatles manager Brian Epstein's house in the Belgravia section of London. The photo of the Beatles below is from the launch. That's a lot of fun facts. And, as a bonus, here is a picture of the Sgt. Pepper cutouts I alluded to in an earlier post.